But what happens when you’re your own boss? In my experience with myself and in speaking with other private practitioners, our usual process of inquiry, vigilance, and employer-employee negotiation skills simply never sees the light of day when we become our own bosses. How often do we interview ourselves for the job of private practitioner? Do you remember your job interview with yourself? Did you explicitly discuss and negotiate your own work hours, between-client rest and reset time, vacation time, salary, diversity of professional activities, peer support, work-personal life balance, etc? Did you ever discuss with yourself how to mindfully choose your own caseload to reduce your risk of experiencing burnout or compassion fatigue? And how often do we inadvertently neglect arguably the most important aspect of running a private practice – the relationship we have with ourselves? “But there are too many other issues in my practice that I need to plan for, worry about, and stress over,” you might argue. But then I would encourage us all to reflect on something vital but too often hidden from view. It’s what Rebecca Wong, LCSW has dubbed “Connectfulness”, and it’s all about the art and science of getting to the heart of relationships and developing the skills to be in optimal and mindful connection with those around us. This Connectfulness often starts with ourselves, however, and it almost always comes back around to our patterns and habits of how we attach and how we treat ourselves. To start, we could distinguish ourselves as “boss” and “employee.” We could reflect on whether those different parts of us as private practitioners are confused or appropriately differentiated and then integrated. To borrow from Internal Family Systems and Dr. Dan Siegel’s life-long work on “integration”, it can be beneficial to get to know the different roles we occupy while aiming to encourage these distinct parts to effectively communicate and connect with one another. If each part/role isn’t seen and heard, then it tends to operates on autopilot and sometimes makes decisions for us, out of conscious awareness. This is when we tend to get pushed by forces seemingly beyond our control down a path toward professional burnout, disillusionment, disconnection, or overwhelm. So, what kind of boss are you? What are your habits of how you lead, guide, and coach in your private practice? What are the qualities and actions that resonate well with you in being your boss self? Are you a boss who is sensitive, patient, compassionate, firm but flexible, consistent, forgiving, planful? Are you sometimes impulsive, demanding, unforgiving, or unaware of the needs of your employee self? 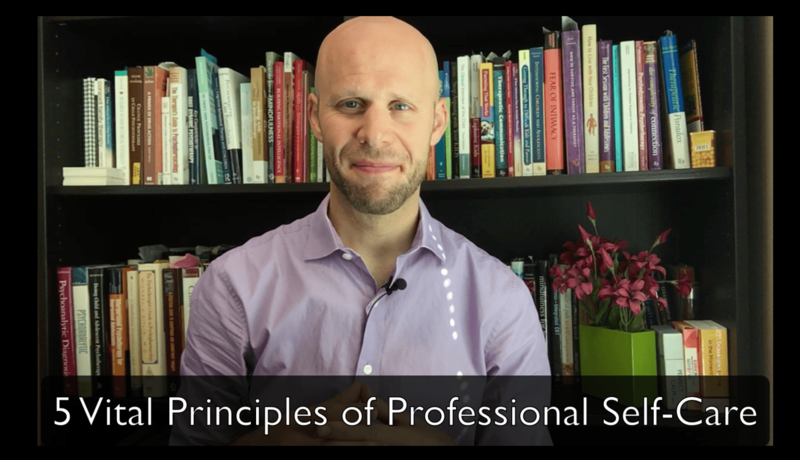 Do you set clear expectations for the values and virtues of running a successful private practice? Throughout each work day do you pay attention to your employee self’s basic needs for movement, fresh air, healthy food, cleansing breath, or clearing of sluggish or overwhelmed energy? Start writing down your reflections and see what shows up. Inquire about what matters the most. Reflect with honesty and kindness about whether you’re embodying the “boss” qualities that you value most and serve you the best. What are your habits of how you care for yourself as an employee? And what are the qualities and actions that resonate well with you in the role of employee? Are you hard-working, careful, responsible, warm, persistent, flexible, non-judging, ambitious, active, calming? Do you sometimes get overwhelmed, impatient, disillusioned? Do you feel put upon or taken advantage of? How often do you advocate for yourself and negotiate with your boss self? Just start writing and see what shows up. Inquire about what matters the most. Reflect with honesty and kindness about whether you’re embodying the “employee” qualities that you value the most and that serve you the best. Constructing a thriving practice is always a multi-faceted, dynamic process. Operating a successful private practice is of course about your skills and training as a mental health practitioner. However, it’s just as much about your financial savvy and your executive functioning skills and larger vision. And it’s certainly about how you relate to yourself in the different roles you occupy as leader and coach, and as employee and worker. Bringing a newfound curious awareness to your boss and employee selves can nudge you onto a path toward sustainable well-being in every role you inhabit and help to create a truly thriving practice and professional life.